Samuel Beckett Bridge: Designed By Dr. Santiago Calatrava Valls, originally uploaded by infomatique. 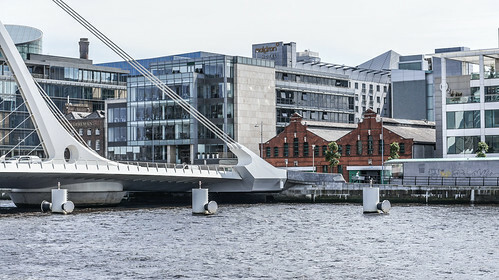 The Samuel Beckett Bridge links the northside and southside of the city over the River Liffey in the Dublin Docklands. Construction commenced in May 2007 and the bridge opened to traffic on the 11th December. The bridge has been designed by the internationally acclaimed architect Dr. Santiago Calatrava Valls, who also designed the James Joyce Bridge. He has created a landmark structure with a curved profile leaning northwards. This dramatic shape gives the appearance of a harp lying on it’s side.